Team 2539 went to the FMA District Event in 2017, on March 3rd-March 5th. The team persevered and pushed through the competition, doing so well that they managed to rank 17th, and earn a record of 10-7-1. The went to the finals with alliance members as Team 2590 (Nemesis) and Team 3974 (E=mCD). Team 2539 had a lot of success getting to the Finals, and it didn't stop there. The team won the first match with an outstanding score of 285 to 195! The Red Alliance then made a comeback in the second match, managing to tie the match at a score of 255! In the third match, the Red Alliance managed to beat our Blue Alliance. Sadly, the Krypton Cougars and their alliance did not have enough to beat the improving Red Alliance in the fourth match. With this incredible effort, the team won a District Finalist Award for the Hatboro-Horsham 2017 season. The scores of the four Finals matches. 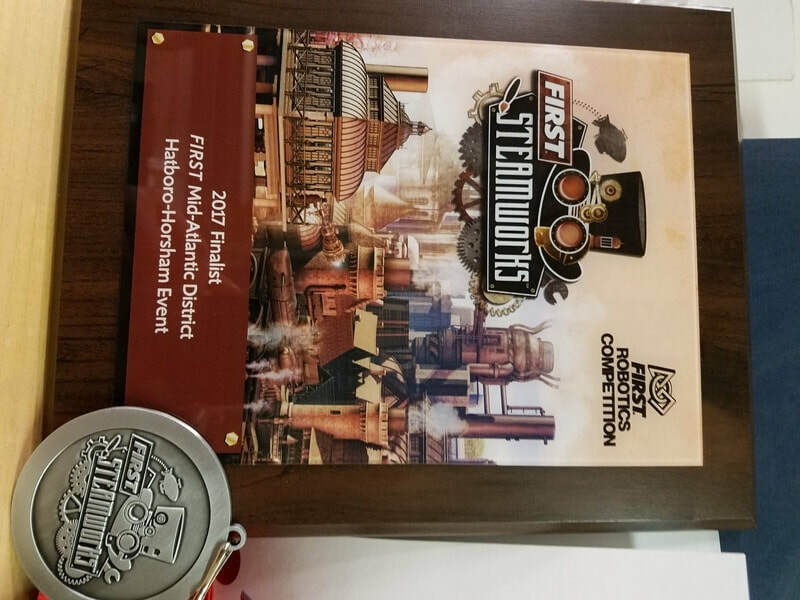 The award earned by Team 2539's outstanding efforts.